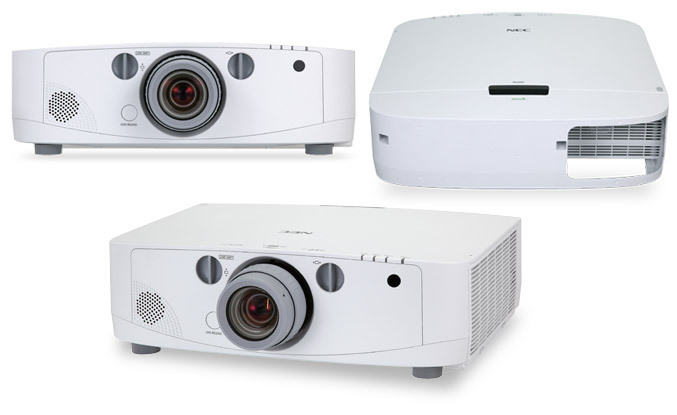 NEC America today debuts its new PA Series projectors and introduces four new models – the PA600X, PA550W, PA500U and PA500X, which are appropriate for large classrooms and corporate conference rooms. The models feature new chassis, improved center lens design and have received HDMI and DisplayPort connectivity. They offer brightness level ranging from 5000 to 6000 lumens, up to 4000 hours of lamp and filter life, and allows up to four projectors to be stacked vertically or horizontally to boost the image brightness up to 24,000 lumens. Other features include ECO Mode technology that NEC claims extends each projector’s lamp life by up to 50%. The PA Series are also equipped with USB ports, integrated RJ45, Wireless LAN and 10W speaker. The PA600X, PA550W, PA500U and PA500X projectors are backed by three year warranty and will be available in March 2011 for $3,999, $3,399, $5,499 and $3,199 respectively.